The persistent ability of the acid sound to withstand revivals and cyclic nostalgia is an amazing phenomenon in the history of electronic music, with its machine-driven ethos continually passed on from generation to generation almost like a folk tale. Yet the music still retains its fundamental modernity, especially when presented with stern contemporary examples. Consider the music of Jared Wilson, whose tracks bustle with improvisatory vigor and confident eloquence. Inspired by the joyous eclecticism of his early influences. from Chicago legends all the way to the UK acid experimenters, Wilson resolutely brings his own analogue sound to the table now – raw, minimal, and devastatingly simple (something that’s rather characteristic of his answers, as well). It has established him as a contemporary acid house and techno specialist with notable releases on Blank Artists, Dolly, Dixon Avenue Basement Jams and his very own label – 7777. In advance of his live PA this Saturday at Smart Bar for Hugo Ball, LWE caught up with him via an e-mail correspondence to discover the history, method and mentality behind his prodigious output. 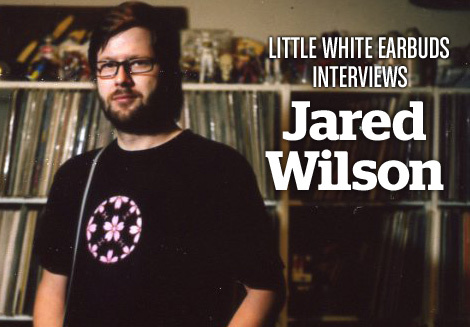 Jared Wilson: Grew up listening to the Wizard on the radio and trying to breakdance. My dad is a musician and had older cousins that were into hip-hop so when I was young I was exposed to all different types of dance music. I’ve always listened to some kind of dance music my whole life. I got into making techno and house shortly after starting to DJ with my friend around ’94. What’s the first piece of gear you picked up? How difficult was it to get your hands on these things at the time? The first thing I ever bought for electronic music was a BOSS DR-660. It was different buying equipment then, no eBay etc. My friend Brian and I would take road trips to visit pawn shops and see what we could find. I’ve heard some producers say it’s hard to just jam on a computer. Does working with outboard gear make the process a little more improvisatory? How do you approach making a track? I don’t know. I’ve seen people “jam out” on a computer. It doesn’t matter what you use. I start with an idea, and from there the possibilities are endless. I suppose parallels can be drawn with your live performance, too. What does your stage set-up look like when performing live? It’s a simple set up, nothing fancy. 303, 101, MKS 50, MPC 1000, some effects. The live set is different than working in the studio. Some parallels can be drawn but it is a different animal. On your last release with Skudge, you use Loleatta Holloway’s voice almost as a texture. Using samples is something your tracks have otherwise been quite devoid of. Is it something you’ve been consciously avoiding? Why the change on this record? No idea, never thought of this. I use samples sometimes and sometimes I don’t. You’ve done many lot of remixes, as well. What do you most like doing when re-imagining someone else’s music? I’m honored they asked me to do it. It’s fun to see what the project turns into. Always like being involved with making a record in any capacity. How much have your academic endeavors influenced your production techniques, approaches and aesthetics? Can you tell us more about your sound installations? I’d say I used my production techniques in my academic endeavors. Starting to use sound in some of my work during art school. Ha! That sounds so cliché. I did a series of sound installations. They varied from minimal analogue rhythms that would travel and move in spaces, to chord changes and lights that would create atmospheres for the viewer depending on their location in a stairwell. When making tracks, do you have a specific dance floor in mind to tailor it to? How have the dance floors changed since you’ve partied in Detroit in the 90s? No specific dance floor in mind. Sometimes I make dance music sometimes I don’t. I see parties and dance floors now that look exactly like the 90s in Detroit. Sometimes even in Detroit! The main thing for me that has changed is people expectations of what a party needs to be. I don’t know, I just like to make and release music, sometimes acid, analogue sounding techno and house music. Other times it varies. Recently, I’ve been focusing more on the dance floor oriented releases. But that may change, who knows. What can we expect from Jared Wilson in the future? Just focusing on the next 7777 Records releases. Kel and then a various artists release. I should have a 12″ out on Cinematic soon. After that we will see. Big respect Jared! I’ve been watching you since the beginning and you’ve never disappointed. What you do, I call intelligent acid. Retro without sounding cheesy and contemporary without being overproduced. Keep it up bro. Dance music needs more producers like you.